Can you believe Christmas is tomorrow!? TOMORROW PEOPLE!! Ahh I am so, so, so excited, actually, excited is a huge understatement! I am one of those people who would happily decorate for Christmas in November and listen to Christmas music all year round! I mean, Christmas music shouldn't just be for the month of December right? In fact I am listening to my favourite Xmas tunes while I write this post!! Anyways to celebrate the fact that Christmas is literally around the corner I have compiled a few of my favourite Christmas items to make into a Merry + Bright Christmas Post!! The first item is my absolute favourite Christmas book, John Williamson's Christmas in Australia! This has been my favourite book ever since I was younger, I even remember bringing to school in grade 1 and my teacher reading it to my class! My favourite line in this book has to be "Yum, yum pigs bum, Christmas pudding, all the ladies do the cooking". The second item is Christmas Related Craft. I love to do craft and when Christmas rolls around I always organize so craft to do in the school holidays with my brother and sister, we gift most gifts off to friends and family and keep our favourite ones. The third item is Christmas Wrapping Paper. My favourite thing to do at Christmas time is wrap presents! I am a fan of the decorated wrapping paper, these two wrapping paper rolls are from Big W.
The fourth item is my favourite Christmas movie, Mickey's Twice Upon A Christmas. I have loved this movie ever since I remember! It includes 4 or 5 (I can't remember) mini movies with Mickey Mouse, Minnie Mouse, Daisy Duck, Donald Duck, Goofy, Pluto and many more characters. The fifth item is Christmas Cards. Christmas cards are my favourite! This year the one on the left is my favourite, it was given to my sister and the joke on the front made me giggle when I first saw it on our Christmas card display. The sixth item is Christmas Countdowns! Every year we have this countdown out and we countdown the sleeps until Christmas. Its always a good feeling when you get to change it to an 0 something, my favourite been 00 sleeps until Christmas! 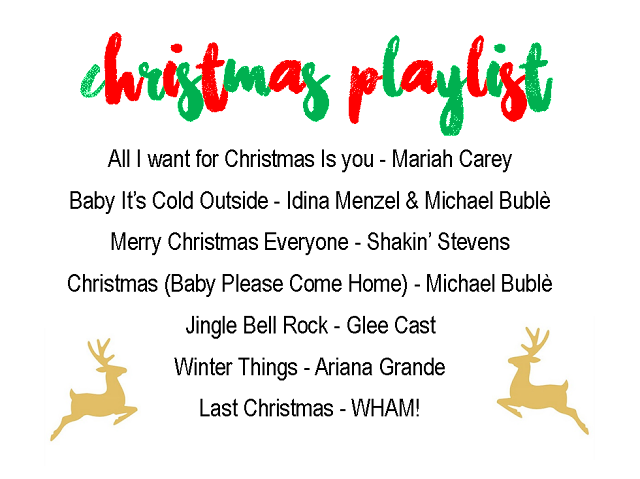 These songs have been on repeat (and some not always on repeat) this Christmas! This year my absolute favourite song has been 'Christmas (Baby Please Come Home)' by Michael Buble. Well that's all my favourite Christmas items this year! I hope you enjoyed this Christmassy post and I hope you have a fantastic Christmas and a wonderful New Year! hyvää joulua. Feliz Nevidad. Bon Nadal. Craciun Fericit. god Jul.